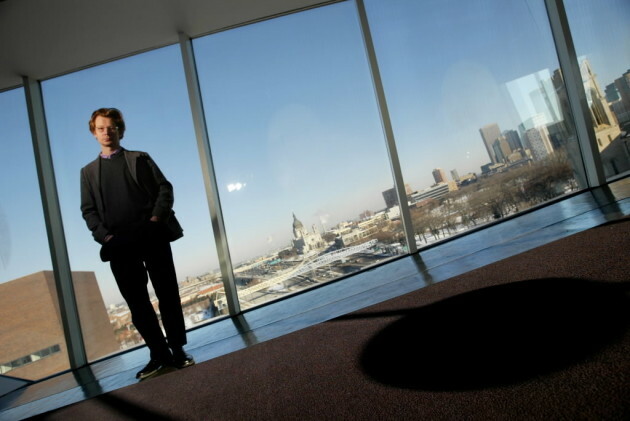 Above: Philippe Vergne in 2005 as the newly appointed deputy director at the Walker Art Center. Photo by Renee Schneider for the Star Tribune. The Museum of Contemporary Art in Los Angeles decided not to renew director Philippe Vergne’s contract, which expires in March 2019. A known character around the Twin Cities, Vergne was deputy director at the Walker Art Center from 2006-2008, and also worked in a curatorial capacity there from 1997-2004. Details about Vergne’s departure are not yet clear, in a statement he spoke of staying onboard during the search process. The search for his replacement is underway, but Vergne will not be immediately leaving his position. Despite the announcement on Friday before the long Memorial Day weekend, Vergne’ departure was not entirely a surprise. Two months ago, all eyes were on Vergne after he dismissed chief curator Helen Molesworth, who had been at the museum for three-years. Reports differed, stating that MOCA had parted ways with Molesworth over “creative differences,” but artist Catherine Opie, who is on the board at MOCA, told LATimes art critic Christopher Knight that Vergne fired her. Molesworth was known for focusing on programs addressing race, particularly through a strong Kerry James Marshall retrospective and partnering with the Underground Museum in LA on a multiyear collaboration. In April, the LATimes reported that Vergne had put his Hollywood Hills mansion on the market, with a sale pending, which only fueled the rumor mill about the possibility of his departure. Before Vergne arrived, a capital campaign goal of $150 million was set. According to reports from the NYTimes’ Jori Finkel, the campaign was not met, and the endowment currently stands at $125 million. He did, however, rebuild MOCA’s staff from 42 employees in 2014 to a total of 60 in 2018. At the Walker, the French-born Vergne organized more than 25 international exhibitions including retrospectives by Kara Walker and the Chinese artist Huang Yong Ping, and the group shows "How Latitudes Become Forms," and "Let's Entertain." Vergne departed the Walker two times, first in 2004 to become director of a new contemporary art museum in Paris being built by French billionaire Francois Pinault. The project imploded, and then was moved to Venice. Vergne did not stay onboard. Instead, he returned to the Walker, where he became the deputy director. Vergne left in 2008 to become the director of Dia Art Foundation in Beacon, New York, where he stayed on until joining the Museum of Contemporary Art LA in 2014. Due this summer, the all-star "Jam and Lewis: Volume One" could feature new tracks by Janet Jackson, Mariah Carey, Mary J. Blige and others. Tickets for the 22 concerts will go on sale April 20.